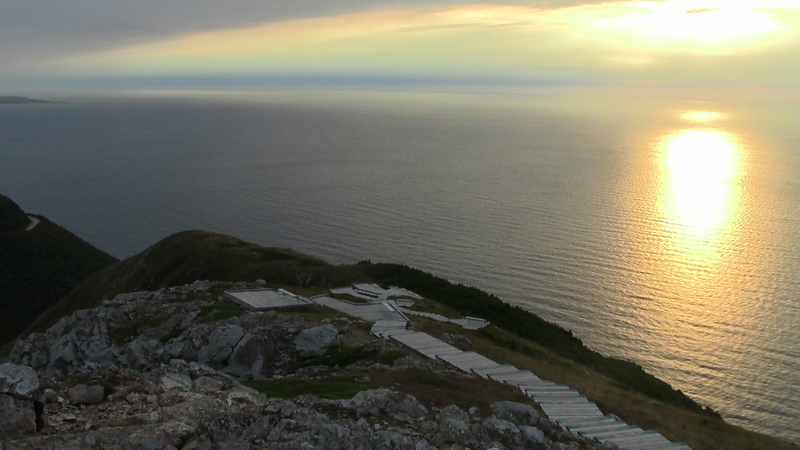 The island of Cape Breton, and yes it is technically an island as it is only connected to the mainland of Nova Scotia by way of a man-made causeway, is the perfect place to experience the great outdoors with some close friend or colleagues. 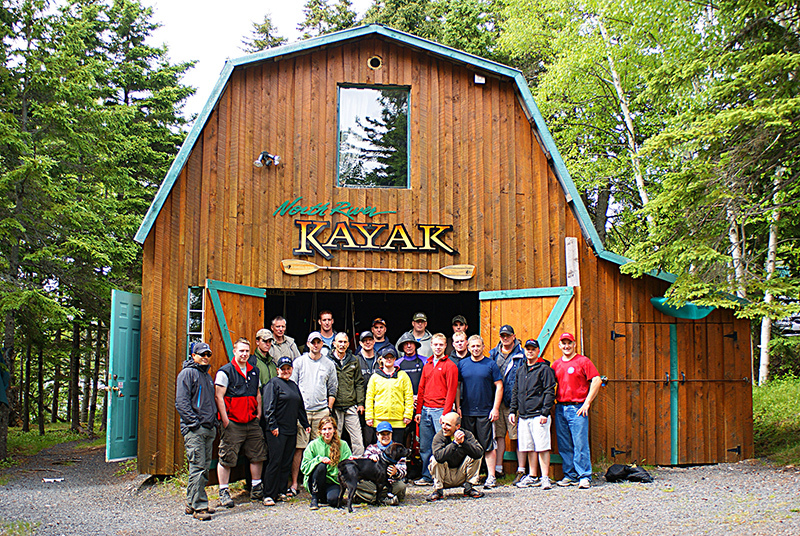 This Halifax based group was looking to explore the Cape Breton Highlands high and low and this is exactly what we did on our 5-day trip together. Our first day on the island and we were looking to reach the clouds and we got pretty close I must say. Climbing the French Mountain our group started our trek through the forest and out onto the exposed ridge of the Skyline trail. 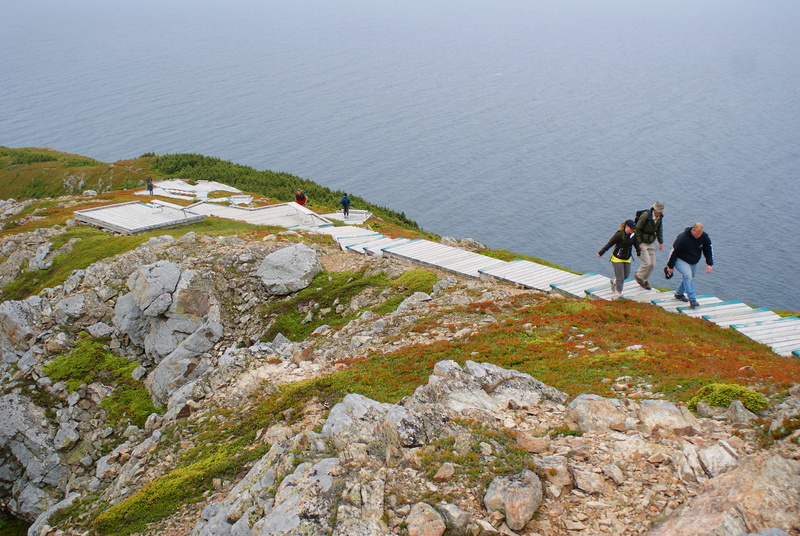 By many locals this has been noted as the best look-off in Nova Scotia, it is sure to please anyone who ventures to the end of this incredible trail. With extensive views over the Gulf of St Lawrence and the surrounding highlands one should take this moment to sit and bath in the splendor before them. The following day we woke with more adventure running through our veins. We set out to the base of Roberts Mountain. Here the rounded coastal mountain rises nearly 1200ft from the ocean below. one might think that would be an easy hike, well you might want to second guess that. As you climb the first half of the mountain your legs will get a great warm up. From here you make your way past the trees and out onto a barren landscape with pink exposed granite. Although we used the surrounding scenery as an excuse to stop, the real reason was because the climb was heart pounding. Arriving at the top was a real accomplishment and the views are absolutely breathtaking. To cool off the group set out onto the open ocean by way of 2 zodiacs to seek out a glimpse of the marine life found in the area. 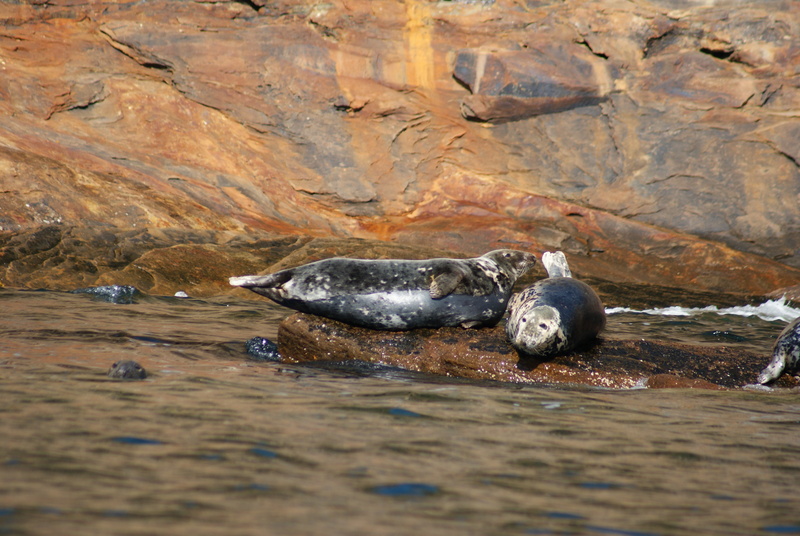 Although to early in the season to spot whales there were a number of seals swimming among the waves and plenty of salt water-soaked group members by the end of the exhilarating ride. The weather could have been a little more cooperative but this didn’t seem to dampen the spirits of this strong group. Another day brings another adventure. We headed out into the fog and hiked until our feet were sore this day. 3 hikes were set for today and we completed them all. First was the short but scenic hike to the peninsula of White Point. Here the waves crashed along the towering seas stacks and sea birds gather in large numbers on the rocks to seek shelter from the rough and aggressive Atlantic. It was then time to hike to the tip of Middle Head. Reaching out into the open ocean the waves were as active as they were all day, creating a rugged scene for all to enjoy. The final hike of the day was a strenuous climb up to the top of Franey Mountain. The fog might have been too thick to enjoy the view, however the hike itself keep us on our toes as this was a full body workout. We needed a good rest after this day. 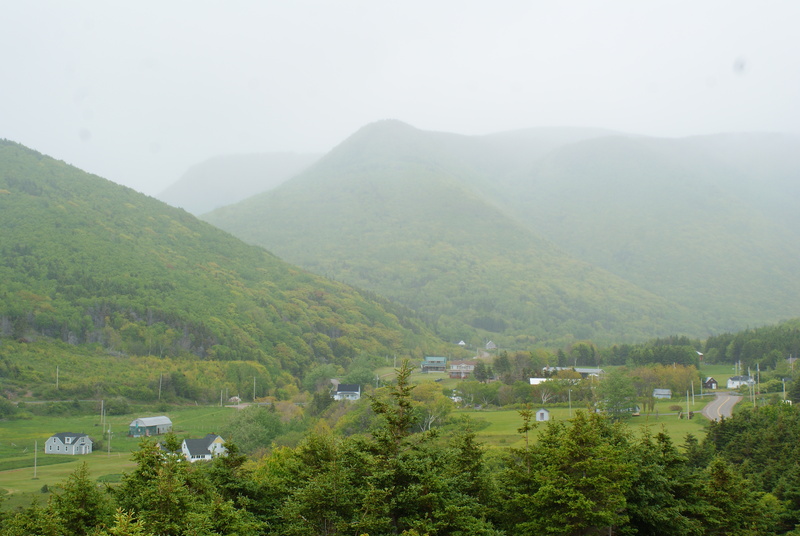 Cape Breton highlands covered in a hazy gloom. 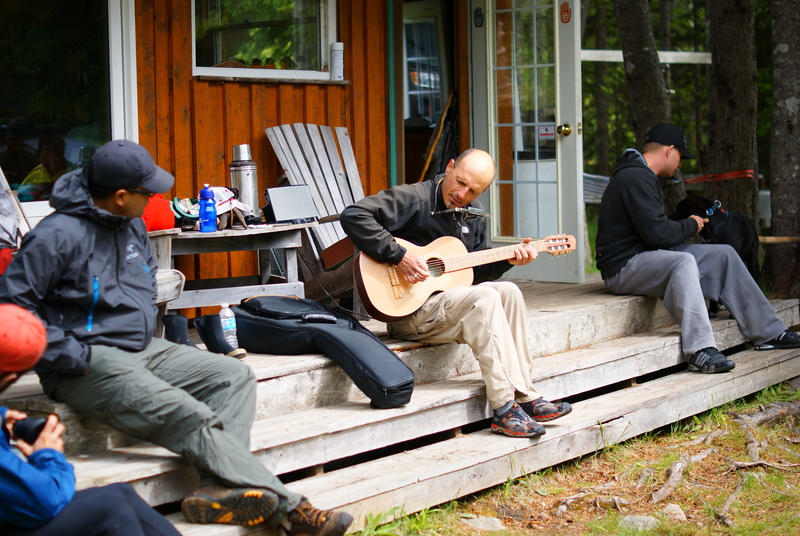 Being a professional musician Angelo topped off our day at North River Kayak by playing 2 songs for our group from his collection of music that he’s been playing for the last 20 years. Talk about talented. After a long and eventful night of camp fire songs and laughter, we rose to a beautiful day with not a cloud in the sky. This was expected as we were treated with a glamorous pink sky the previous night. You know what they say: “Pink sky at night, sailors delight”. Sailing is just what we had in mind. 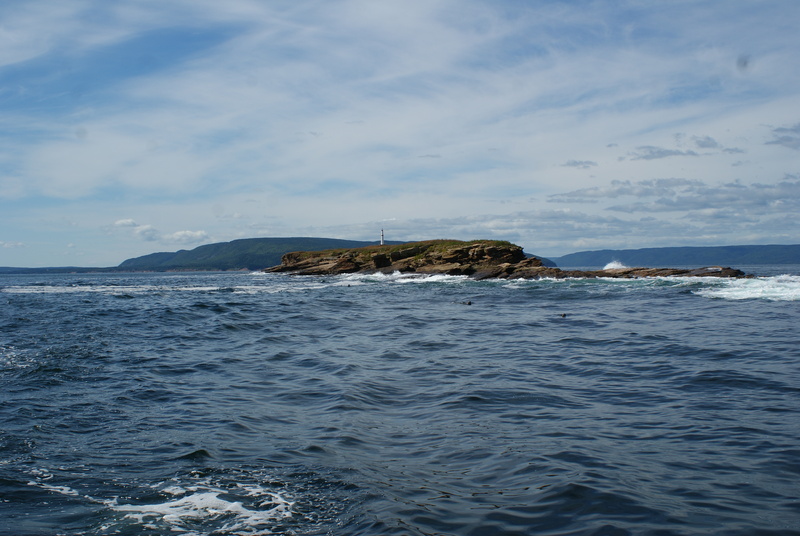 Though many were tired from the last 4 days, the group set out on St Ann’s Bay to see Nova Scotia’s largest Puffin colony at the rightfully named, Bird Island’s. Here the Puffins show off their brightly colored beaks and feet for all who watch from the circling boats. We ended our day with a healthy lunch in Baddeck, where the most famous past resident Alexander Graham Bell once lived for 30 years, you may have heard of him. This island really does have so much to offer. Whether you are looking for an outdoor adventure, a historic or cultural experience, Cape Breton has everything you need to fuel your inner traveler. 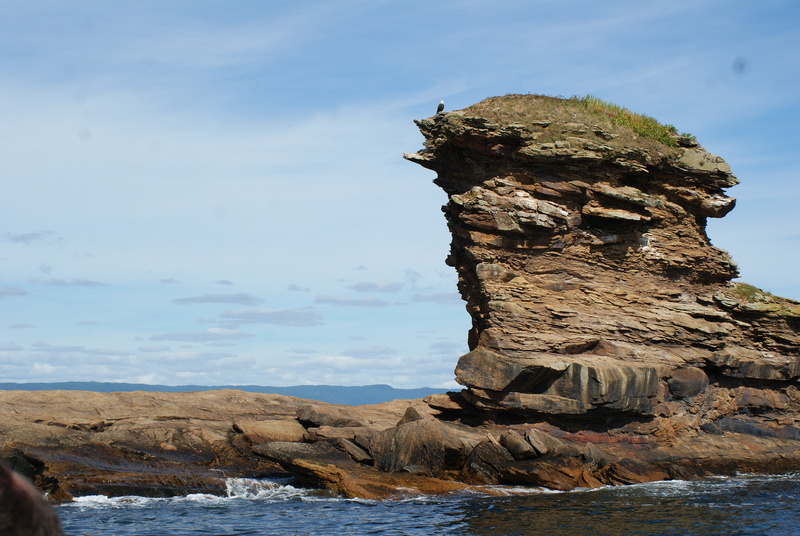 So whether you are traveling on your own or with a small or large group, come experience Cape Breton Island with Nova Scotia’s #1 adventure tour company and leave this place with great memories, photos and a whole lot of food for the soul.